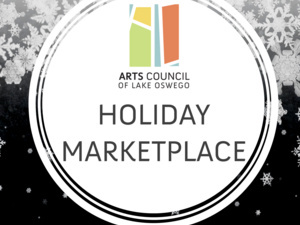 Join the Arts Council of Lake Oswego for the second annual hand-selected, all-media Holiday Marketplace. This exhibition showcases work including fine art, wood, ceramics, jewelry, metal, handmade gifts, ornaments, textiles and accessories. Nov. 2, First Friday Opening 5–7 p.m.
Nov. 28, Friends Shopping Night 6–8 p.m.
Dec. 7, First Friday Reception with discounts from 5–7 p.m. This curated collection of work by local and regional artists includes pieces from Gallery Without Walls artists Mike Suri and Sharon Warman Agnor; local favorites Bill Baily, Lisa Wiser, Andy Vessely, Jenny Watson and Ha Austin; to the popular work of The House of Rose leather goods creative, Tony Iyke and the beautiful jewelry collections from Girl in the Pearl, Stubborn Stiles and Brianna Luce, just to name a few. Purchases directly benefit the artists and community-enriching programming of the Arts Council.